This Pavilion style tiny house is called The Toulouse. It’s designed to serve as a luxury garden building. One might also use it as a backyard pool house or guest quarters. But if you’re a tiny house lover like I am, you’re probably already thinking how it can easily work as quite an awesome tiny cabin for full-time simple living, right? It’s a 16′ prefabricated log cabin with a dome shape. It also has an enclosed entryway. 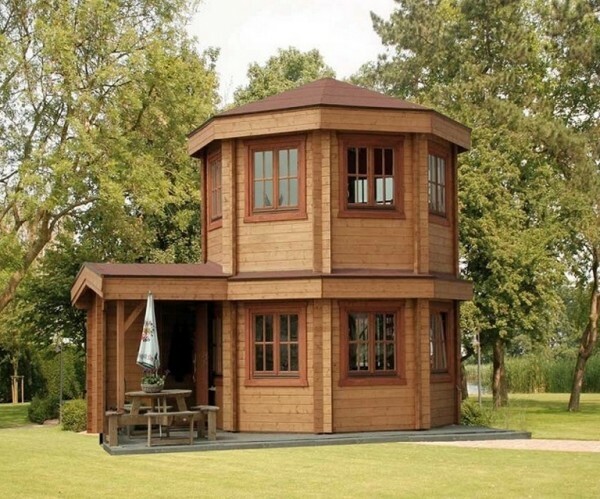 So what do you think about turning this structure into your own dream tiny home? If you’d like, let us know in the comments and either way please enjoy and re-share below. If you wanted you can add gutters to the design along with a rainwater collection system. If you’re interested I encourage you to learn more about the Toulouse Pavilion cabin below. So, after visiting the site and looking over the pics, I can say with some certainty that there are no bathroom facilities in the plans. So, not much for the tiny house market, there. The shape is terrific! I’ve got a grain bin I’d like to turn into guest quarters at our hobby farm that would follow similar idea (except I’d give them someplace to ‘go’). Wouldn’t take much tweaking to get a bathroom in it or as an added room. That entry porch would convert into a hallway with no fuss. Or move the entrance, and convert the porch into a bathroom. Easy fix for this one. Great design. The small room off the front entrance should be the bathroom. There is one of these on Fawn Island in the St. Clair River, Ontario, Canada. That room is the bathroom. Accessible from the house and from a door on the outside. Family that owns it uses this as their cottage in the summer. Outside bathroom entrance because it is used as a change room for swimming. This is a very nice design that could easily be turned into a tiny home. A small bathroom could easily be incorporated into it, in my mind, on the second floor, or even the first floor. After looking at all of the THOW’s, an efficient bathroom doesn’t have to take up a lot of square footage. There are a lot of possibilities here according to one’s preferences. Three features I really like is the entrance, the circular staircase, and all of the windows. Dump the spiral staircase and put in a dumb waiter and I’d be interested. And no, that is NOT an insult to waiters… go look up the term if you are unfamiliar with it. So how would you get upstairs to you bedroom? Dumbwaiters aren’t for people. Dorothy, you’re funny and right all in one. I can see several places to add a full bathroom, as well as a toilet and sink upstairs. However, I could live without the dumbwaiter! Toss in a nice bath and I’m sold! Yes! Please help me keep up to date on tiny house developments. If a decent bathroom could be added to this house, I’d definitely go for this. So charming, so well-designed. A real winner! If my calculations are correct, the house is 415.5 sq ft [about 207 per floor?] Certainly large enough to be used for a TH. The only question, then, is where to add the bathroom. A wet room should certainly be doable. Well, one more question, actually: The list price is in pounds so – – would it be available on this side of the Atlantic? I doubt it. This design is similar to Deltec homes in North Carolina. While they have large fancy homes they also have smaller models, one and two stories. A canadian option is Mandalacustomshomes.com Check them out they all have different possibilities. This looks to be a shell with no insulation, so geared more to seasonal usage or warm areas. Like the timber framing, but not for norther climates without substantial changes. One could put a potty under the stairs and hide it with the plant and a wrap around bamboo type walling? Just a thought, put the plant on wheels so you can move it in and out of the way when needed, like a door:) Just a thought after all. So beautiful on the outside! For me to save on the costs though I’d have to consider a less costly version of a Yurt. What If You Can’t Do Or Want Stairs? I like this a lot, and with that entry hall it would be easy to add another room or even a second tower. Is there any way to purchase this kit or similar in the United States? I am completely in love with it!!! Attractive shape but I would have to paint some of that wood. Adding a bathroom would make it perfect. Like the Log Cabon Scotland comment above, this is a custom log cabin. So, add the bathroom you want, redo the layout, add on if you need more space. The fact is this cabin is well made and can be anything you like. Although I prefer a painted inside to brighten things up, the wood in this cabin is growing me. If I could afford to have Log Cabon Scotland build me one, I would. Thanks for sharing it. If this has a decent bath, I might consider it. I have a nice piece of recreational property and it needs a nice small house on it. Fell in love with the exterior. But oh dear who in their right mind puts the dining area on one floor and the kitchen on another. I know I know you dont have to do that arrangement. So yes I can see myself in this but not with spiral stairs. For some unknown reason I have a great propensity for falling down stairs. I would go with the dumb waiter I think.